Welcome to the Digital Portobelo Interactive Project! This interactive project make’s use of DH Press, a WordPress-based digital humanities visualization toolkit developed at The University of North Carolina at Chapel Hill’s Digital Innovation Lab and the Renaissance Computing Institute. Among its many features, DH Press offers a dynamic way of exploring oral histories and other audio material. 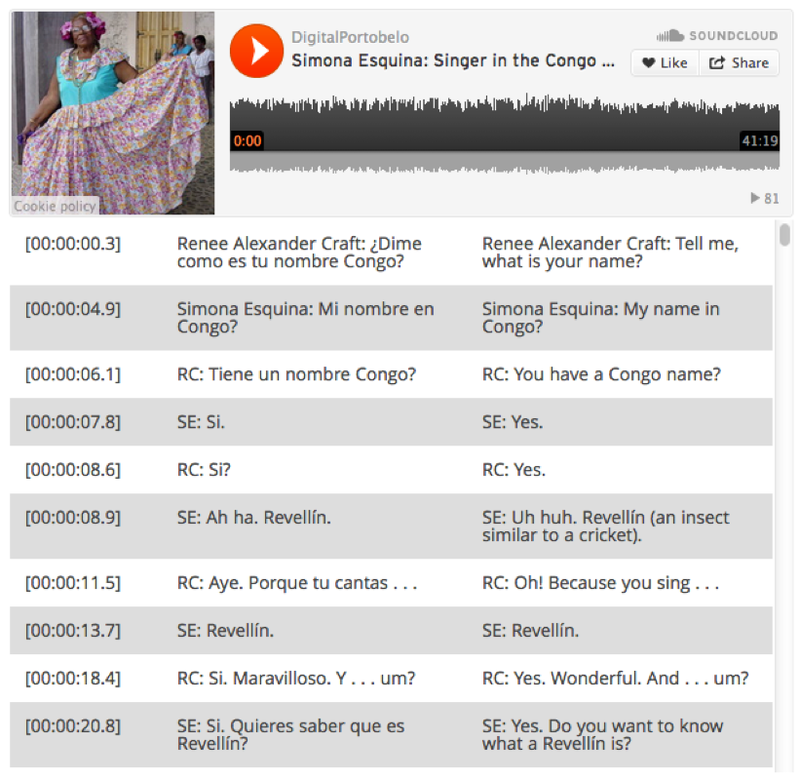 With our unique Audio/Transcript Tool, users can listen to interviews while simultaneously reading the corresponding textual transcript. Users can explore individual excerpts or listen to interviews in their entirety. Digital Portobelo is the first instance of using DH Press for bilingual oral histories. Nearly every interview has been transcribed in Spanish and English, and both versions of the transcript appear side-by-side. Users need not understand Spanish to enjoy the rich content contained in these interviews. DH Press now supports both map-based and gallery visualizations. You can explore either visualization through the links below. In the project’s first launch, we were constrained to use only the map-based visualization to create the interactive project, and assigned latitude/longitude coordinate pairs to each of the 93 interview excerpts. Each excerpt is represented by a colored dot on the map. These map dots do not represent literal location points; rather, they are intended as a figurative spatial representation of the contents of these interviews. All interviews can be accessed in three ways — through an interactive gallery, an interactive map, or through the interview archive. Exploring the gallery: Each topic card appears in the gallery as an image that represents an excerpt of an interview. Clicking on any card will bring up that segment of the interview. Clicking on the green “Listen the entire interview” button in the marker pop-up window will open up a new browser tab, where the entire interview and its corresponding transcripts can be accessed. Clicking on the green “Read more about this excerpt” button opens to a page with additional information about that chunk of interview. 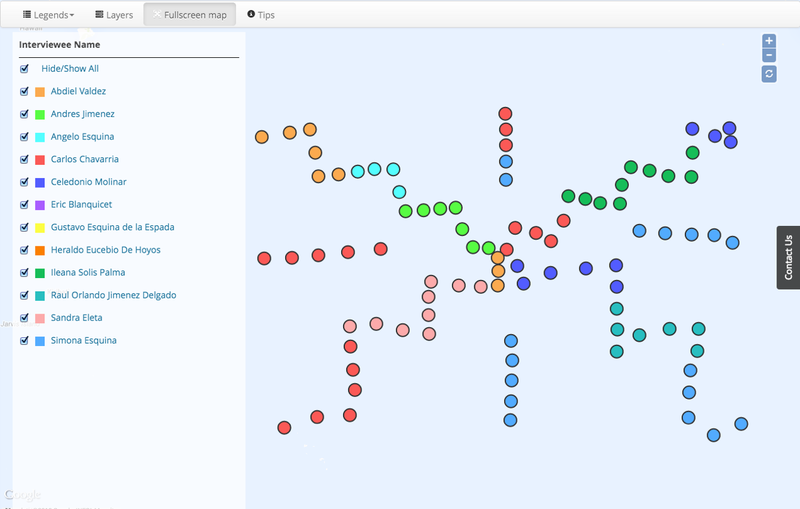 Exploring the map: Each dot on the conc ept map represents an excerpt of an interview. Clicking on any dot will bring up that segment of the interview. Like the gallery, clicking on the green “Listen the entire interview” button in the marker pop-up window will open up a new browser tab, where the entire interview and its corresponding transcripts can be accessed. Clicking on the green “Read more about this excerpt” button opens to a page with additional information about that chunk of interview. Please consult our help page to learn more about how to navigate the map. Exploring the full interviews: The interview archive links to the full audio files for each interview, along with the corresponding transcripts. Under each scrollable transcript is a list of related excerpts. Clicking on any of the titles will provide more details about a given excerpt. Please note that the map will likely not load properly in Internet Explorer; users are encouraged to view the map in either the Firefox or Chrome Browser.